Without a doubt, playing is Justin’s favorite activity. It’s the first thing he does after having his milk in the morning or sometimes immediately after he wakes up, after his school, before he takes his afternoon nap, after napping, and before he goes to bed. If he’s too excited about a new toy, he sometimes cuddles that toy with him when he sleeps. Click on the badge above to see more playtime fun. 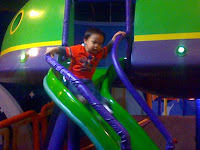 This entry was posted in Mommy Moments, Playtime. Bookmark the permalink. justin sure does love playing..dami niyang toys..nice.. Play is such a major part of a kid's life, it's nice to watch them playing. Adults also learn something from them, like patience in assembling some toys, perhaps? 🙂 I certainly need more of such virtue. Happy mommy moments! i agree with the whole first paragraph. cute that he has a healthy interest with anything with wheels. He's so cute. Kids that age really enjoy playing a lot and I miss having a toddler. Happy weekend. Hi Mommy! Thomas should be present talaga in every toy box. Its just this summer that my son was able to experience and enjoy playtime in school.